Last night the Downcity District Design Review Committee met to review applications by The Procaccianti Group of Cranston to demolish two Downcity buildings. The buildings in question being 111 Fountain Street (the Fogarty Building) and 197 Fountain Street (the Old Public Safety Building). The committee postponed ruling on the demolitions until the designs for new buildings at these locations are more fully realized. Greater City Providence applauds this decision by the DRC. 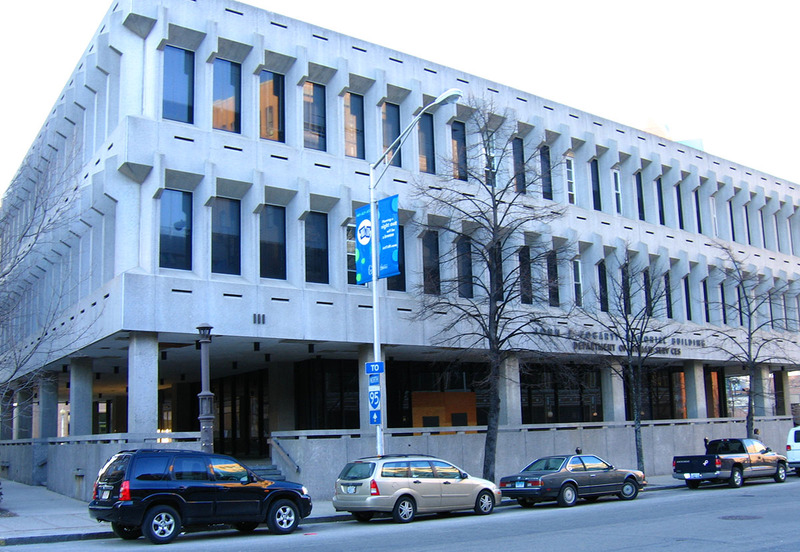 The Fogarty Building has many detractors, however it is a valuable example of the Brutalist style of mid-century architecture, a style that is not well represented in Providence (some would be happy about that lack of representation). As unloved as the Fogarty Building is, the proposed replacement is no better and in the view of some, actually worse. The Procaccianti Group has proposed a new building at this location with one story of retail at the street on the Sabin and Fountain Street sides, with 6 levels of structured parking above. The entrance to the parking garage would be located on Mathewson Street and the loading docks would be located on the Beverly Street side. 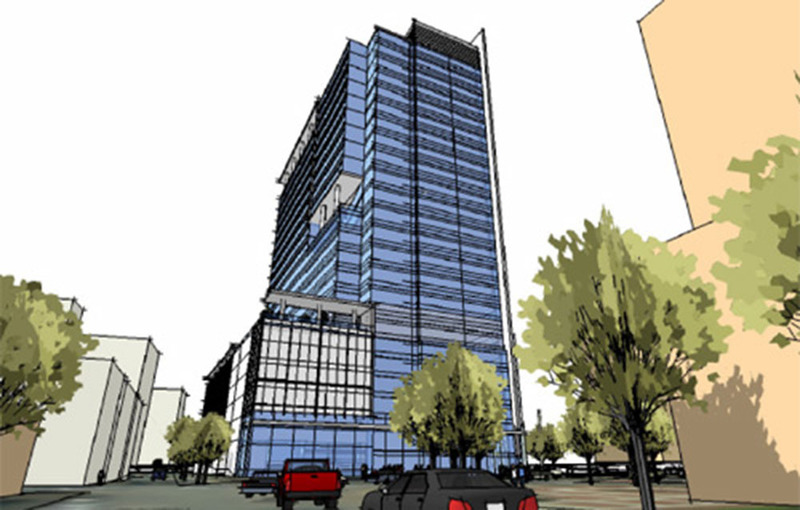 The proposed building, dubbed OneEleven Fountain Street would feature blue-ish green glass framed in aluminum on the retail level. The parking structure would be made of precast concrete in a light tan color with black flecks, and the parking decks would be screened by a linked metal mesh. Greater City Providence does not feel that this proposed building is a proper replacement for the architecturally significant Fogarty Building and does not feel that this building is a worthy addition to the great historic palette of Providence architecture. The modern design elements are not the issue, in fact in this potentially fresh and dynamic emerging area (The “Power Block” as The Procaccianti Group has dubbed it) modern design is a refreshing addition to Providence’s cityscape. This building however presents the worst of modern design, being little more than a box and a poorly hidden parking structure. We urge The Procaccianti Group to go back to the drawing board with this one. There are many examples of parking garages around that country that don’t scream “parking garage” from the street the way this building does. TPG should look to Boston’s Motormart Garage in Park Square, The New Street Parking Garage in Staunton, Virginia, or their own Westin Hotel and Residences project here in Providence (a block from 111 Fountain Street) which features a well screened parking garage above street level. These examples are all more classical styles but lessons can be learned from them and applied to a more modern vernacular. At the Old Public Safety Building The Procaccianti Group proposes to build a 22 story office tower dubbed The Empire at Broadway. The Old Public Safety Building would be removed to make way for this building. The building would feature retail on the Broadway and Empire Street facades, the entrance to the parking garage would be at the corner of Green Street and Fountain Street, and the main entrance lobby to the building would be on the corner of Broadway and Empire Street, on LaSalle Square. Greater City Providence doesn’t have as much issue with the design of this building, the designs are very tentative but appear to be heading in a good direction. However it is simply heading in a good direction, it needs to be much more fleshed out and TPGs ultimate plans and timetable for this development need to be better explained before permission to demolish the Old Public Safety Building is given. Old Public Safety Building, Fountain Street Facade. In this case, careful and full consideration should be given to the possibility of preserving at least the Fountain Street facade of the Old Public Safety Building and sensitively incorporating it into the new structure. Greater City Providence is eager to see these projects get underway. 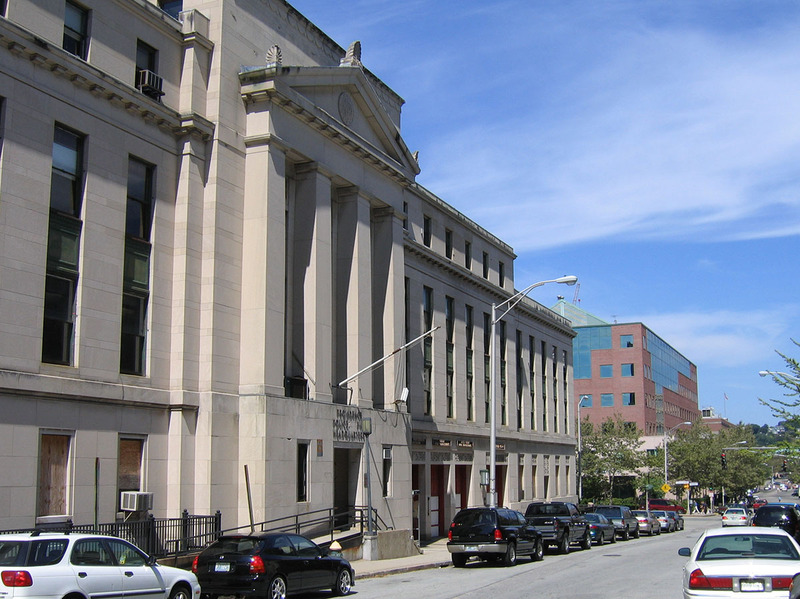 Both the Fogarty Building and the Old Public Safety Building have sat vacant for far too long and are detrimental to the streetscape and to the connection between Downcity and Federal Hill and the West Side. All parties involved though, from the developer, to the city, to the general public need to carefully consider what gets built at these locations. We will be living with these buildings for a long time, getting them wrong is not an option.